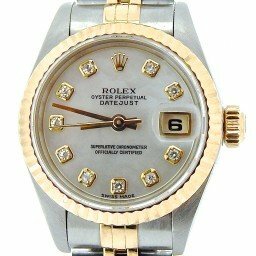 In the beginning, Rolex wristwatches were exclusively for the ladies. The Rolex name may be synonymous with rugged tool watches, but a ladies Rolex is still the number one choice for that versatile piece to balance function and style. 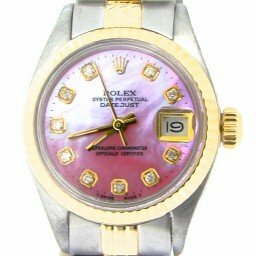 So, if you’re searching for a ladies Rolex watch, you’ve come to the right place. 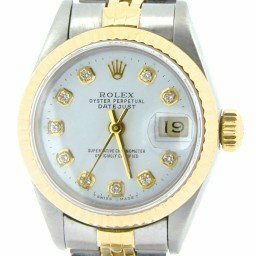 Our selection of pre-owned Rolex watches for women are guaranteed authentic and offer something for everyone. 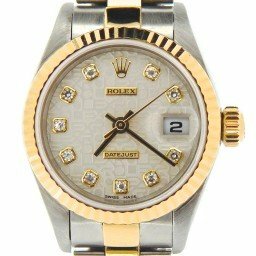 Browse popular models, such as the Rolex Datejust ladies two tone or ladies 18K Yellow gold President timepieces. 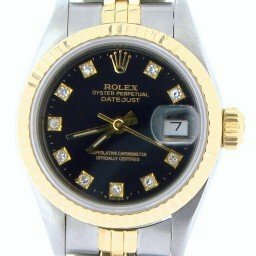 Also view our mens Rolex watches as well. You’ll find that our watches are authentic and offer an assortment of colorful dials and variety of bezels and bracelets to fit anyone’s style and budget. In addition, we offer an industry-leading Lifetime TradeUp Guarantee on qualified items and 30-day return policy for peace of mind. So, explore our huge inventory to find your perfect timepiece. Or, contact our expert staff so that we can help make that ultimate difference for you. Although watch collecting is seen by some as a particularly male-dominated activity, the truth is, the skill and craftsmanship that goes into creating fine mechanical timepieces is something that can be appreciated equally by both sexes. 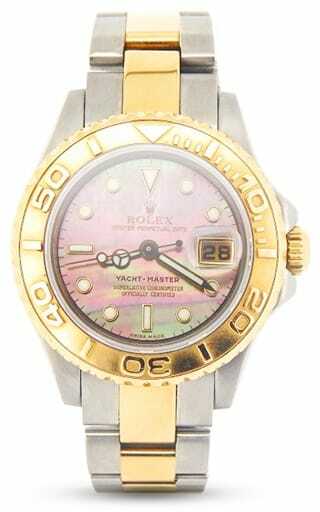 The timelessness of many of Rolex’s designs make them suitable as either men’s or ladies watches. With modern fashions tending towards larger sizes for female wearers, the doors have been opened for more women to wear pieces initially intended for a solely male audience. There are, however, several models classed as exclusively for women. Subjected to the same uncompromising standards as any of Rolex’s offerings, the brand’s ladies range is constructed with the same artistry and attention to detail, but with more feminine dimensions. Here at Beckertime, we have a wide selection of these stunning timepieces. Below we’ve highlighted a number of our most popular. The first of the Yacht-Master series was released in 1992 as a more luxuriously-appointed variant of the archetypal Submariner. The original 40mm piece was joined a few years later by both a ladies version at 29mm as well as a midsize in 35mm; the first of Rolex’s professional range to be offered in three sizes. Since then, as times and tastes have changed, there is no official ‘ladies’ Yacht-Master anymore, or the midsize, and the current family consists of just the full 40mm model and a 37mm version that is listed as both a men’s and women’s watch. Clearly modeled on the Sub’s rugged good looks, the Yacht-Master borrowed heavily from the brand’s legendary diver, including elements such as the rotating bezel and identical handset and indexes. But where the Submariner has at least tried to hang on to its tool-like credentials, the Yacht-Master is aimed at those who spend their lives riding the ocean waves rather than exploring beneath them. 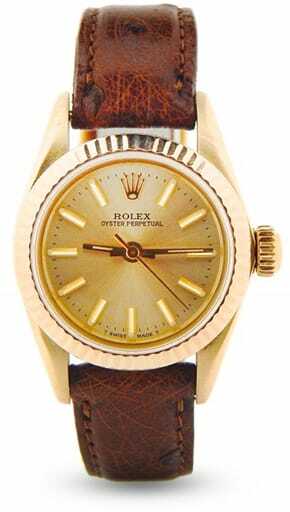 It is a watch intended to look at home strolling a polished teak deck or lounging in the club following a regatta, so has only ever been crafted from Rolex’s own three flavors of gold, along with two-tone Rolesor and, another debut with this particular watch, Rolesium—a stainless steel case and bracelet, topped with a platinum bezel. Its sleek lines and abundance of precious metals make it a particular favorite as a ladies watch in whichever size it comes in. Even the 40mm piece, thanks to its gracefully sweeping profile and delicate lugs, suits more slender wrists without overpowering. As a pre-owned buy, the smaller 29mm and 35mm models represent tempting bargains. You will find superb examples for around the $5,000 mark—both likely to increase in value due to their finite supply. The Yacht-Master is a sporty yet elegant all-rounder, the ideal choice for almost any occasion and with enough variety to suit any taste. 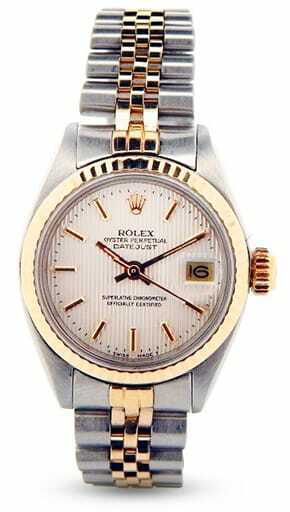 When the subject of a lady’s Rolex comes up, it is the Datejust that most readily springs to mind. Like its male-focused counterpart, it is one of the most versatile watches ever made, effortlessly treading the line between casual everyday companion and dressy evening wear. Again, similarly to the Yacht-Master, more and more women are finding the traditional men’s sizes the perfect complement, especially the ubiquitous 36mm. However, the Lady Datejust range, originally a 26mm model and recently increased to 28mm, has been a staple of Rolex’s lineup since 1957. In 2012, the brand upped the stakes a little more by also introducing a 31mm version. In its 60-year reign as the ultimate timepiece for sophisticated women, the Lady Datejust has been issued in a breathtaking number of different combinations of dial, bezel, metal and bracelet options. Appealing to every taste and budget, it is available in anything from stainless steel all the way through to pure platinum, via yellow, white and pink gold and two-tone Rolesor versions. It can be as inconspicuous or as flamboyant as you wish, with bezels ranging from smooth to fluted to dripping in diamonds, and the dial can be had in any color and set with every gemstone you can think of. 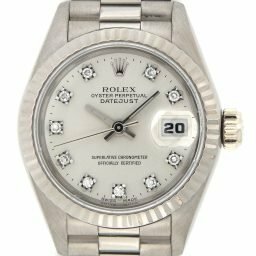 The Lady-Datejust has been such a phenomenon for Rolex that it is actually the brand’s biggest seller of all time, outstripping even the men’s version. There is practically no situation it cannot match, making it just about the only watch you will ever need. Rolex’s simplest, least complicated offering, the Oyster Perpetual series has a history even longer than the Datejust. The men’s version has traditionally been 34mm, recently joined by both 36mm and 39mm models and, typified by its stark minimalism in style and materials, is often regarded as the entry point to the brand for many. However, the Lady Oyster Perpetual family contains a few altogether more lavish pieces, with editions in gold and Rolesor, and some with the added luxury of diamond-enhanced bezels and hour markers. The earliest examples were just 24mm in diameter, tiny by modern standards yet, while certainly diminutive, the watch has never seemed flimsy or delicate. Instead, it has the exquisite flowing lines that have always been the backbone of the Rolex design language—graceful rather than fragile. 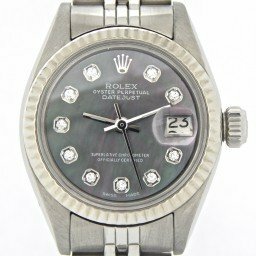 Today, there are 26mm models, the smallest in the Rolex lineup currently, and 31mm, both classified as exclusively lady’s watches. Together with the three men’s sizes (the 34mm is now technically a midsize) there are a total of five different versions for the Oyster Perpetual. As a watch, it is about as unfussy as it is possible to be, with not even a date function to spoil the view of the dial. Even those rare lady’s models with gemstone accents have an austere restraint, and the cleanness of its design means it remains as timeless an accessory for women as a little black dress. If you are in the market for a watch you can wear everyday and never look over or under dressed, a Lady Oyster Perpetual should be top of the list. 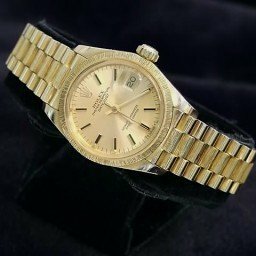 Considering that, for the first hundred years or so of their existence, wristwatches were the sole preserve of women, you would think Rolex, the world’s most successful manufacture, would have a much better stocked archive of ladies models. However, when the company was formed in 1905, it was at a time when the first inklings of the wristwatch’s usefulness to men over the ubiquitous pocket watch were being felt. Wartime battlefields were the real proving grounds. The frontline soldiers discovered that having a timepiece that could be read at a glance rather than one that had to be fished out of a tunic, opened and then put back, could be a literal lifesaver. Nevertheless, the real heyday of the men’s wristwatch was still a good few decades off, really coming into its own post WWII. Much of Rolex’s early output, then, was split evenly between male and female pieces. The latter was a relatively eclectic mix of dainty dress watches and scaled-down versions of the more robust looking men’s models. Also, Art Deco influences were widespread. The design movement from the 1920s and 30s, which could be found in both luxury goods as well as mass-produced merchandise of the time, were characterized by sleek and stylized geometric forms. After the Second World War, Rolex began to concentrate very much on its men’s collection, leading to some of the most iconic timepieces ever created. The ladies range was centered around just a small handful of names, particularly the Lady-Datejust and the simple Oyster Perpetual. These were mainly sub-30mm varieties of the originals, their smaller dimensions giving them an innate elegance, while the liberal use of precious stones on bezels and hour markers lent a touch of opulence. In more recent times though, the number of models aimed at women has increased—slightly. 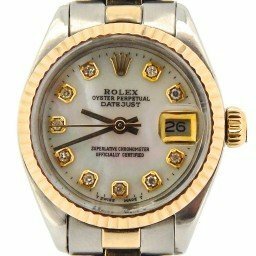 First came the Pearlmaster series, what Rolex call their ‘crowning jewelry watch’. These even more gem-lashed variations of the Datejust are the brand at its most sumptuous, with nothing but gold case options and each one spectacularly iced. Then, just a couple of years later, two smaller versions of the men’s 40mm Yacht-Master surfaced, making it the first of Rolex’s sports pieces to come in three sizes. Only the 29mm was officially recognized as a lady’s model, with the 35mm touted as a mid-size. However, by the time of their release in the early 90s, the fashion for ever larger watches was in full swing across the board, and 35mm was perfectly acceptable on a female wrist. In fact, more and more women had started wearing traditional male sizes in the 36mm-plus range. Suddenly, seeing one of the brand’s legendary professional series—the Submariner, the Daytona, the GMT-Master etc., all 40mm pieces, worn by women was becoming evermore commonplace. That trend has opened up the ladies collection to accommodate a wider array of sizes, so the current lineup has pieces ranging from the tiny 26mm Oyster Perpetual to the largest of the Pearlmasters, at 39mm. 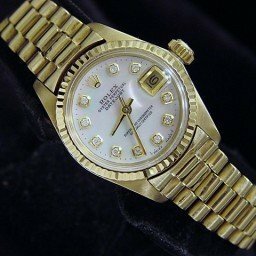 But at whatever size, the women’s watches have always shared the same level of design and engineering exactitude Rolex has long poured into their men’s models, their culture of unrelenting perfectionism giving the brand the sort of reputation no amount of money can buy. Below, we will take a look at some of the most important ladies models in the Rolex story. We will cover the different combinations of metal type, color and detailing and also see which have the best investment potential. 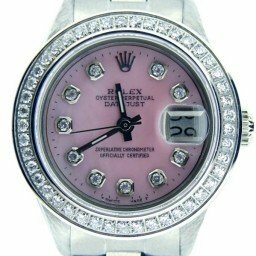 As a very general statement, Rolex’s women’s collection is usually less expensive than their nearest equivalent in the men’s range. 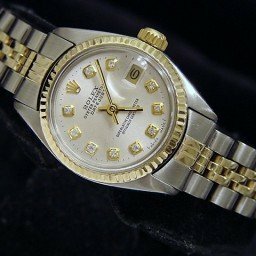 A Lady-Datejust, for instance, in two-tone Rolesor, which is about the most quintessential ‘Rolex’ look of them all, can be acquired for as little as $2,000 or so. The larger piece—same year, same metals, just sized at a male audience, will likely cost you at least an extra $1,000 on top of that. The same is true with the 26mm version of the Oyster Perpetual, except the initial buy-in price is even lower. Stainless steel models of the long-established entry level piece hovers around the $1,500 mark. The lower costs are more a reflection of the amount of core material needed to make the watch rather than a statement on their popularity. 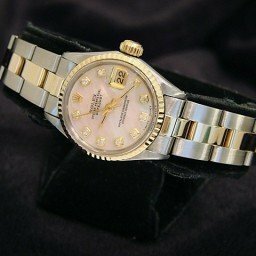 Over the course of Rolex’s history, the Lady Datejust is actually their biggest seller; bigger than the men’s version, bigger than any of the sports watches. For women looking for that perfect complement to just about any outfit and any occasion, the Lady Datejust has most often been first port of call. 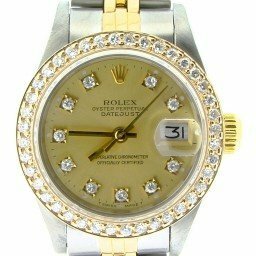 There are, of course, Rolex watches for women which are even cheaper than that. Hunt around on the vintage market and you will find numerous examples of their very early work, some truly fascinating pieces from the Art Deco era, which cost less than $1,000. 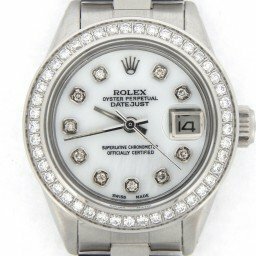 By comparison, the higher likelihood of a women’s watch to be outfitted with precious stone enhancements makes those at the top end of the scale very pricey indeed. Perhaps the biggest drains on the bank balance remain some of the contemporary Pearlmaster series. The ref. 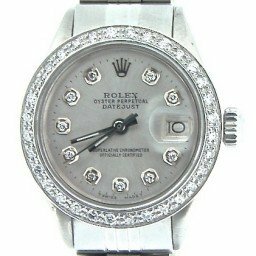 81409RBR, a 34mm example, technically has a white gold case, although you would never know it as the dial, bezel,and bracelet are completely covered with literally hundreds of hand cut and set diamonds. Expect to pay way north of $100,000 for yours. Where the men’s and women’s ranges differ most noticeably is in the premium collectors are willing to spend on the pre-owned market for certain metals. It’s often considered counterintuitive when people are willing to pay more, sometimes vastly more, for a steel piece of a certain men’s watch over a gold version. 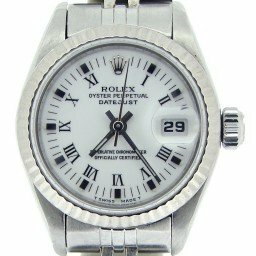 Stainless steel tool watches remain immensely popular, and Rolex fosters a huge demand by severely restricting the number they make available for sale. As they become more and more scarce and sought after, the price obviously rises. The same is not true with women’s watches. Here, all is as you would expect. The precious metal versions, in gold or platinum, are the more expensive options, and those with gemstone embellishments are dearer still. Happily however, one attribute both share is their residual worth. 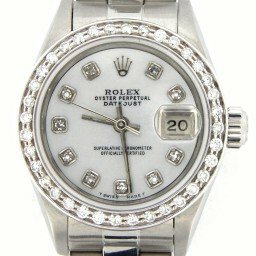 Unlike just about every other luxury item on the planet, a Rolex watch for either gender will reach a level beyond which its value will not drop. 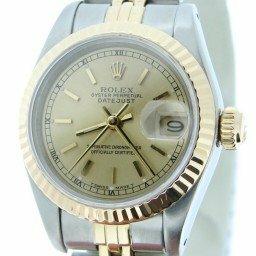 It means the buyer can be reasonably assured that they will be able to sell their watch in the future, should they so wish, for around the same amount of money as they paid for it. Although perhaps not as extensive as the men’s, the number of options in the ladies collection is still fairly comprehensive. Even removing all of the fabled professional watches, bar the smaller Yacht-Master, it still leaves plenty of variety in metal, dial design, bezel type and bracelet. 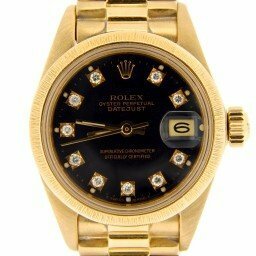 First off, Rolex uses three colors of 18k gold which, for many years now, have been forged in its own dedicated foundry. Located deep underground in their Plan-les-Ouates base in Geneva, the brand manufactures its alloys with 750% (thousandths) of pure gold, and mix it with different elements to give each its distinctive hue. Their red gold, Everose, was the last to come in-house in 2005, containing traces of copper to lend it its warm tones, then sealed with pure platinum. You will find gold features prominently in the women’s collection. This goes back to the very earliest days of the brand when they also used 14k and 9k. With the majority of Rolex’s output for a female audience intended as dress rather than tool watches, the softer precious metal is used in just about every model. It is a similar story with platinum. One of the densest and heaviest metals in the world, it too is manufactured in Geneva, ensuring its quality. Beautifully vibrant, platinum is found at the higher end of the Lady-Datejust range and also makes up an alloy of Rolex’s own concoction, known as Rolesium, adopted exclusively by the Yacht-Master. With a steel case topped with a platinum bezel, the Rolesium Yacht-Masters were first introduced in 1997 and have been a popular addition to the series ever since. The other proprietary bi-metal blend, Rolesor, a mix of gold and steel, is a classic aesthetic that can also trace its roots back way into the past. Again featuring a steel case, gold is used on the bezel and the center links of the bracelet to give a best of both worlds feel. And, of course, pure stainless steel is another common usage, more often marking the financial entry point on most models. 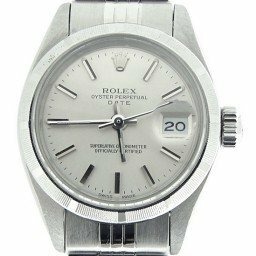 Almost uniquely in the industry, Rolex uses 904L steel (what they now call Oystersteel) for its incredible toughness and its ability to hold a polish better than the 316L found with other manufacturers. The dials in the women’s range show a great deal of variation as well. 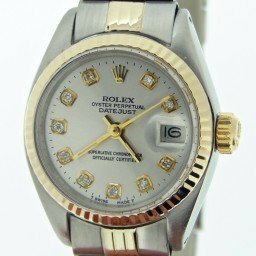 You will come across just about every color in the Lady-Datejust and Oyster Perpetual families; from traditional monochrome black and white, through silver and champagne and on into some of the more flamboyant and eye-catching shades. 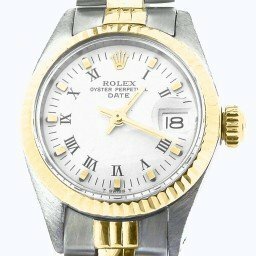 On top of that, Rolex has also issued several pieces with dials made from some out of the ordinary materials. Also, hour indexes run the gamut from the simplest baton type to both Roman and Arabic numerals. Mother-of-pearl was and still is a very popular choice and there have even been editions with faces crafted from wafer thin slivers of genuine meteorite. 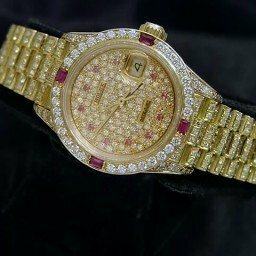 Far more common on women’s watches than men’s, diamonds have long been a feature, used just for the markers themselves or else to cover the entire dial. 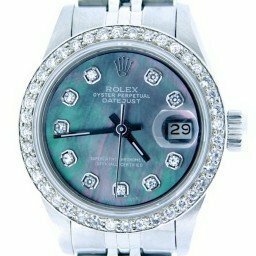 Typically, Rolex employs legions of gemologists and jewelers to select, cut and set each stone by hand, taking only those classified as at least IF (standing for Internally Flawless) in clarity, and between D to G in color—those grades closest to white. As for the bezels, a rotating surround has been a vital aspect of many of the men’s collection since they first appeared in the 1950s. On pieces such as the Submariner they act as a safety feature, while on the GMT-Master they serve as both useful guide as well as lending a visual identity. For the ladies series, only the Yacht-Master has a revolving bezel, its numerals and gradations standing raised from the surface rather than engraved into it like most of the others. On pieces such as the Lady-Datejust, you can choose between the familiar three different types—smooth, fluted and engine-turned. It and the Pearlmaster watches have plenty of gemstone versions too. And, you will also see the bracelets fitted to the women’s range are similar to the men’s, except smaller. The three-link Oyster is the most unassuming, while the Jubilee, invented in 1945 for the Datejust, is far more intricate, with its five links. The President, another three-link band, but semi-circular rather than flat, was created especially for the flagship men’s Day-Date. The only other model it has ever been officially fitted to are certain versions of the Lady-Datejust (which then become known as the Datejust President). Finally, the Pearlmaster series has been awarded its own bracelet, with five distinctly rounded links that look unlike anything else in the catalog, more often than not decorated with jewels. As we mentioned earlier, the sizes of Rolex’s women’s watches have been subjected—a little—to the whims of fashion over the generations. From the very earliest pieces, through to as recently as the 1970s, it was possible to buy sub-20mm models; barely more than a decorative wristlet with a timepiece embedded. The more standard-issue watches, the ones released as part of various series’, have always existed in the range of 24mm and up. 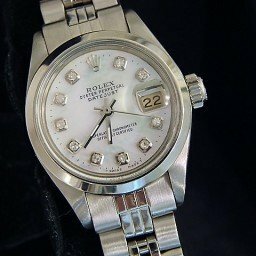 Nowadays, the smallest in the Rolex lineup is the 26mm Oyster Perpetual, with 28mm being the starting point of the Lady-Datejust. 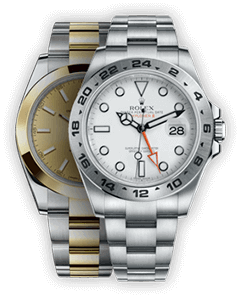 Confusingly however, while the Lady Yacht-Master released in 1994 was 29mm, and the so-called midsize was 35mm, neither now exist. 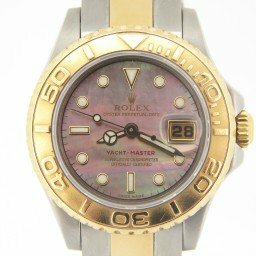 Clicking onto the ‘Women’s Watches’ page on the Rolex website gives you the 37mm Yacht-Master as a ladies size, bigger than the traditional men’s watch standard for most of the 20th century. It just goes to show how much has changed in the last few years. Of course, there is no restriction on the dimensions of ladies timepieces anymore (if there ever was to begin with) and so, as always, the right size is the one that looks best on the wrist. Whether the watches across either gender continue to get bigger is just a question of wait and see. However, we are noticing the first signs of an end to the vastly oversized pieces, with several manufactures releasing smaller versions of their core roster lately. 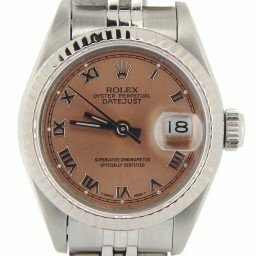 Rolex has never really gone in for the highly functional. Until the start of this century, the Daytona’s chronograph or the GMT’s dual time zone capability were as complicated as they got. More recently, the Sky-Dweller and Yacht-Master II have upped the ante somewhat. But ultra complex models are still very few and far between for the brand. For the women’s collection, they don’t really exist at all. The date feature, although certainly revolutionary when it was introduced in the 1940s, really represents the pinnacle. Minimalist, three-hand timekeepers make up the whole range, although it could be argued the rotating bezel on the Yacht-Master is an added utility. That being said, the calibers driving them are, if anything, even more impressive than those found inside the men’s models. Those movements have always been relatively large, giving them an inherent strength ideal for a lifetime serving inside a rugged tool watch. With the much reduced size of the ladies pieces, the mechanisms likewise have to be much smaller, while still retaining their industry-leading accuracy. 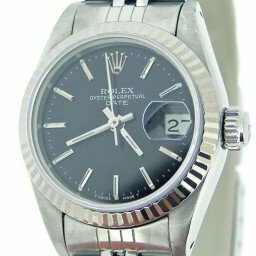 On top of that, Rolex also had to find a way to shoehorn in the components to operate hacking seconds or Quickset date functions. That is remarkable in itself. But when you learn that two of these tiny contemporary calibers, the Caliber 2130 and its successor, the Caliber 2230, had the highest first time pass rates of any movements tested by the COSC, it becomes truly extraordinary. 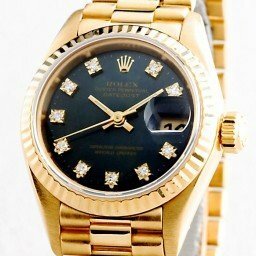 Probably the biggest difference between collecting men’s Rolex and collecting women’s Rolex is in the number of those extremely rare, grail-like references enthusiasts dedicate their lives to hunting down and acquiring. Such watches are generally from the professional range, like early Double Red Sea-Dwellers or exotic dial Daytonas—pieces with great back stories, real scarcity value, and commanding incredible prices. The ladies collection doesn’t really have any of these particular specimens, those numbering barely more than a slack handful of remaining examples to fight over. 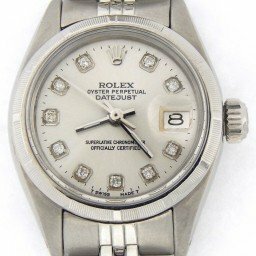 Instead, the huge and immediate appeal of models such as the Lady-Datejust and the smallest of the Oyster Perpetuals means they have always been made in great quantities and so there are plenty to choose from on the pre-owned market. Obviously the further back in time you go to pick yours, the more rare they are likely to be, but they still remain surprisingly attainable. Perhaps the closest parallel to a grail find in the women’s range is in Rolex’s Cellini line. The brand’s unashamedly luxurious series of out and out dress watches has been around for decades, and is still going today. However, these have long been overshadowed by others in the catalog. It is where you will find some weird and wonderful experiments, with pieces of all shapes and sizes. The Cellini King Midas is one such illustration. 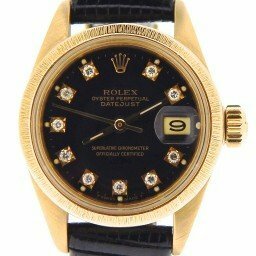 A bizarre, asymmetrical rectangle with an integrated bracelet, the men’s version first appeared in the mid-sixties and was, at the time, both the most expensive Rolex available as well as the heaviest gold watch in existence. It should come as no surprise that Elvis Presley was one of its highest profile owners. The smaller ladies style is actually a comparatively understated piece, with a design just retro enough to find an appreciative modern audience. (Interestingly, it also came in both left and right handed types). Others in the Cellini range run the gamut from the modestly unassuming Danaos, with its vintage-looking cushion-shaped case, through to statement pieces such as the exquisite ref. 5227, a diamond set bracelet watch with ferrite dial. 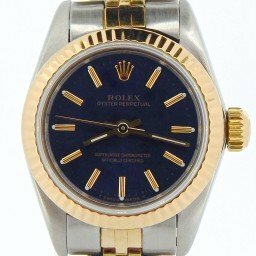 One other watch listed as a men’s model but with a color scheme that would suggest otherwise is the ref. 116519 Daytona Beach collection. This series of four vibrantly colored versions of the world’s most famous chronograph was launched in the 2000s and features blindingly bright shades of turquoise, green, yellow or pink, on either mother-of-pearl or chrysoprase dials. It is reminiscent of the Stella dial Day-Dates from the 70s, and definitely one to consider if you are looking to make an impression. 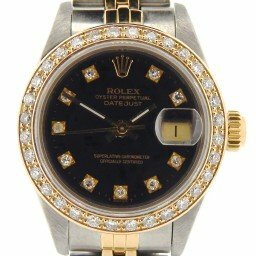 No other company has done more to popularize the wristwatch as a male accessory than Rolex. When first founded, timepieces worn on the arm were very much the sole preserve of women. It wasn’t until the twin innovations of the waterproof Oyster case and the self-winding Perpetual Movement made wristwatches both more convenient and more robust than pocket watches that men started to recognize their appeal. The bulk of the brand’s ladies output have been miniaturized versions of their men’s watches ever since, with the Lady-Datejust being the biggest selling model of all time. Launched in 1957, more than a decade after the original, it has gone through a similarly relentless series of improvements as its male counterpart. Over the years, the women’s collection has grown slightly in size and number. So where the initial Lady-Datejust was just 26mm, today it measures 28mm. The range also includes a 31mm and a 34mm (just called the Date), neither officially ‘Lady’ watches, but far more likely to attract a female audience. The smallest watch in the whole stable remains the 26mm Oyster Perpetual, but that too has been joined by supposed mid-sizes, again at 31mm and 34mm. 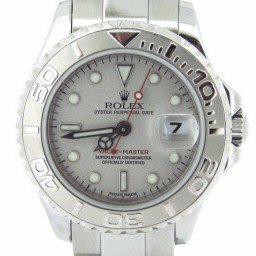 In 1992, Rolex launched the Yacht-Master, a 40mm men’s watch that was flaunted as the more luxurious alternative to the iconic Submariner. Two years later, a 29mm Lady Yacht-Master arrived, along with a 35mm, making it the first sports watch the brand had created in three sizes. Also during this time, we saw the release of the Pearlmaster series, a new variant of the Datejust range. Crafted only in 18k yellow, white or Everose gold and dripping with precious stones, they confirmed the trend for women wearing larger sizes by being issued in either 34mm or a once unthinkable 39mm. 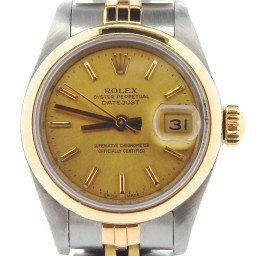 Those first all-gold pieces were supplemented in 1996 by two-tone Rolesor editions, and the following year, Rolex debuted their new Rolesium construction, with a steel case topped with a platinum bezel. Currently, the Yacht-Master family is missing a women’s watch, being comprised of a 37mm and the full-size 40mm. This opulent jewelry watch now represents the peak of the ladies collection. 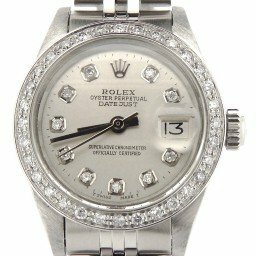 The Rolex name may be synonymous with rugged tool watches, but the world’s premier manufacture is still the number one choice for many women looking for that versatile piece to balance the widest selection of outfits. As uncompromising in its engineering and design as the men’s collection, Rolex’s ladies range are some of the finest watches that’s possible to own.